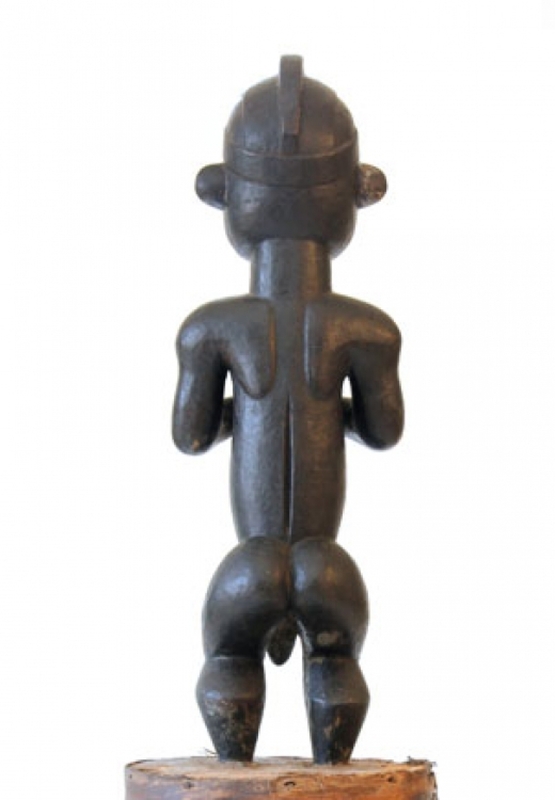 This is a fine copy of a Reliquary Ensemble from Musee’ d’Ethnographie in Geneva, collected in 1927 by the Pastor Fernand Gre’bert in Gabon from the Ogooue River during the conversion of a Betsi chief. 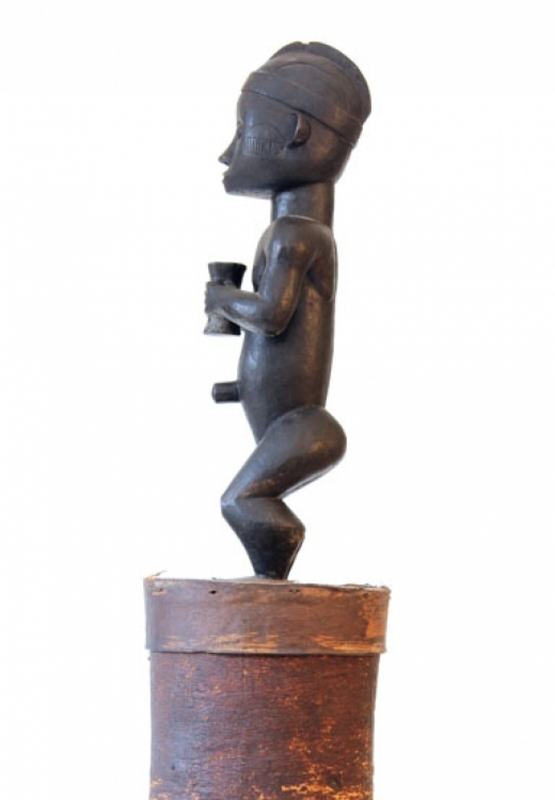 This piece is unique due to its intact condition: the standing reliquary figure remains positioned at the summit of its original cylindrical bark receptacle (Nsuk Byeri), with its feet planted in the lid, serving as a guardian of its unknown relics. 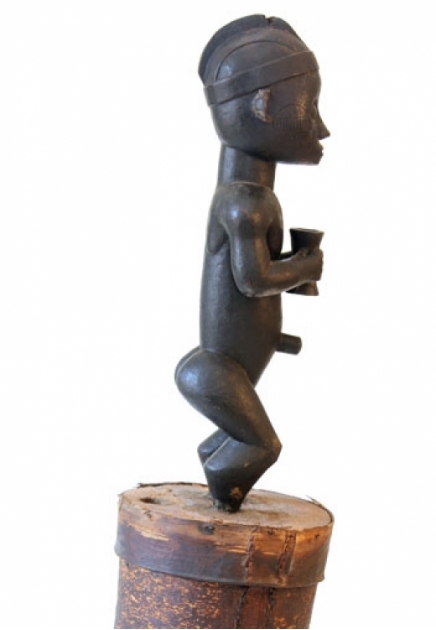 The Byeri figures, very often, were called “Medicine children” (mwan biang) – an ambiguous combination of infantile and mature qualities, of being at once infantile and ancestor, child and parent, as they are sometimes called “these little people”. The Fang ancestor figures mediate between the material and spiritual worlds, between this world and the other world. 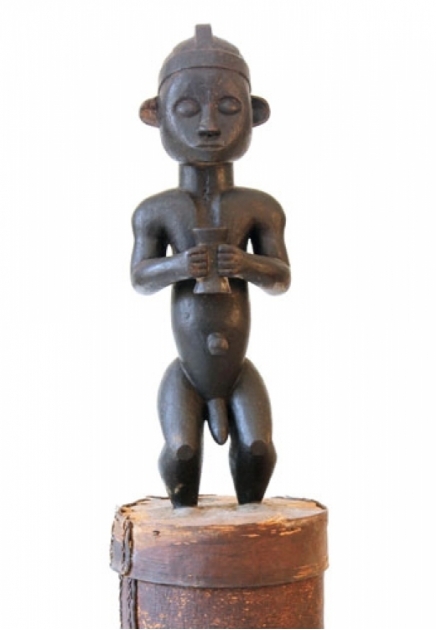 This adolescent figure holding his magic or “medicine” cup may embody the “medicine child”. L. Perrois, Fang, 2006, p.132, pl.39; J. Fernandez, Principles of Opposition and Vitality in Fang Aesthetics”, 1966, pp. 56-59.